Tannoy is set to unveil a new update to its CMS series at InfoComm 2014 this month. With the introduction of its Dual Concentric transducer design in 1947, Tannoy established itself as a leader in all areas of the sound industry, from fledgling early-era live sound reinforcement and recording to home playback. Tannoy’s chief engineer at the time, Ronnie H. Rackham, created a low-frequency drive cone that also behaved as a waveguide for the high-frequency compression driver nestled concentrically within it, resulting in a smoother, more intelligible sound at any listening level. The principles behind the dual concentric remain a cornerstone of Tannoy’s business over six decades later. The new CMS 3.0 features a new development of Tannoy’s dual concentric transducer technology. As the world gave birth to rock and roll and artists like Elvis Presley and The Beatles began changing the musical landscape forever, the dual concentric loudspeakers found favor in the professional studio recording world. Tannoy’s dual concentric was an essential component behind some of the most prestigious and infamous recording studios in the world, with a pedigree that included major studios like Decca and Abbey Road, artists like Elvis, Jimi Hendrix, The Beatles, and albums like “Dark Side of The Moon”, “Thriller”, and many more. By the early ’90s, high-end studio monitors were a staple of Tannoy’s business, accounting for a large percentage of the brand’s business across the world. Meanwhile, sound systems in the live arena and at home were becoming more sophisticated, bringing high-quality audio to all areas of life. It was at this time that the North American Tannoy office hit upon a novel application for dual concentric technology—an idea that was to change the shape of the company forever. Marc Bertrand, CEO of TC Group Americas, the North American business arm of Tannoy’s parent company TC Group, was in charge of the order desk and the North American marketing for the brand at the start of the decade, and as such, was in a prime position to witness the next leap for Tannoy. In 1947, Tannoy chief engineer Ronnie H. Rackham created the industry-changing Dual Concentric transducer design. Tannoy Ceiling Monitor System (CMS) Series loudspeakers delivered consistent and practical high-quality audio reproduction from an in-ceiling device for the first time. After an initial introduction to market with key contractor and consultant accounts, it was success in every major casino in Las Vegas that cemented and enhanced the product’s reputation worldwide. Over the two decades that followed, the company continued to carve out the market for premium in-ceiling audio in both performance and everyday sound applications. The new CMS 3.0—the third generation of Tannoy’s in-ceiling loudspeaker system—is being launched to the world at InfoComm 2014, and features a new development of the company’s dual concentric transducer technology. Promising higher degrees of intelligibility, more consistent broadband directivity, and a brighter, more accurate soundstage, CMS 3.0 represents a new level in sonic performance from a ceiling loudspeaker device. In addition to improved sound and smooth predictable coverage, the all-new CMS 3.0 also introduces several mechanical and aesthetic features to benefit both systems designer and contractor alike. The new line of dual-concentric-equipped CMS comprises five models—CMS 403DCe, CMS 503DC, CMS 603DC, and CMS 803DC—each designed to replace previous equivalent iterations, plus an all-new CMS 803DCQ eight-inch high-Q model, designed for high-ceiling/longer throw applications. At the heart of each device is the next-generation Dual Concentric transducer, providing improved performance by virtue of a fundamentally new design. 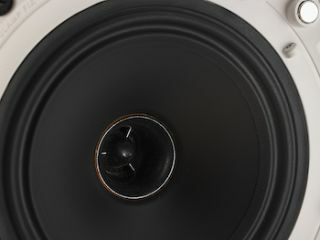 Tannoy’s CMS 503DC is one of five dual concentric CMS models the company will be unveiling at InfoComm. Billed as ‘The most significant evolution in the dual concentric design for over 20 years’, the new driver features Tannoy’s new Omnimagnet technology and a unique Torus Ogive Waveguide assembly to deliver more consistent and controlled directivity, with notable improvement in higher frequency ranges in comparison to previous generations. The new design also delivers improved time alignment and greater coherence between LF and HF, resulting in an even wider sweet spot and brighter, more defined and precise sound—for appreciably enhanced performance both on and off-axis. In addition to new driver technology, CMS 3.0 also benefits from new magnetically adhering grilles, easy to fit or remove (for hassle-free custom painting) and available in either Classic (traditional, inset within the bezel) or new Arco style—designed to conceal the entire unit, including the bezel, beneath a sleek architectural grille, for applications where mitigating any aesthetic impact is a driving factor. A new molded-baffle design contributes further to the loudspeaker performance, providing subtle extension to the waveguide effect of the driver itself. Around the back, there’s an all-new clamp design offering greater extension (for thicker ceiling panels) and a unique locking design that prevents over-screwing that could lead to clamps falling out during installation. Each model (except CMS 401DCe) is available in both PI (pre-install) and BM (blind-mount) variants, as with previous CMS Series iterations. All models are 16 ohm, making them ideal for use in low-impedance systems, such as in conjunction with Lab.gruppen LUCIA amplifiers, while additionally featuring an integrated low insertion loss line transformer for 70 V / 100 V distributed applications. “Having enjoyed huge success with CMS Series over a long period, we had a good feel for the market in terms of how we could develop the product further,” explained Philippe Robineau, director of engineering for Tannoy. “We listened closely to the consultant community and our key contracting customers and identified the areas where we needed to focus, in order to make a great loudspeaker even better.